The story of STREAT Coffee starts when co-founders Rebecca Scott and Kate Barrelle worked for KOTO, a training program and restaurant providing street youth with life and job skills in Hanoi. Following her time at KOTO, Rebecca visited many outstanding social enterprises in Thailand, Laos and Indonesia. Seeing the positive impact of such social enterprise work, this inspired Rebecca to pursue this as a research topic in her Masters of International and Community Development. STREAT was born from such key experiences and research. In early 2008, STREAT Coffee piloted the program. They tested the model and developed strategies, policies and procedures to expand the model further, 2009 was used to lay down foundations while 2010 they kick-started the program. I chat to Michael Lawson, from STREAT Coffee about their work. STREAT Coffee believe that every young person should be given the opportunity to reach their potential. This isn’t possible for a young person if they don’t have somewhere safe, affordable and loving to belong. While there is no “one size fits all” definition to social enterprise, I have come to understand it as a business that uses the market for social good. From my experience volunteering, as well as exposure to large bureaucratic institutions that are out to “change the world.” I find the former challenging to keep volunteers long enough to create sustainable change (retention is low). While the latter requires so many systems and procedures that “good intentions” often result in poor social impact (form over substance). While the space is still very young in Melbourne, I hope and believe social enteprises will pave a way to both a sustainable, pragmatic way of doing good. 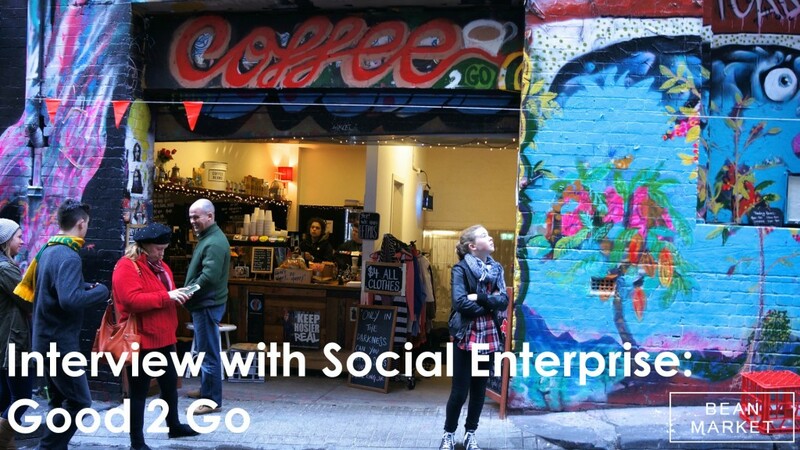 I interview Kirsty McKenzie from Good 2 Go by Youth Projects and get her insights on doing good. Ninety percent of the Dumerso coffee community in Yirgacheffe – Sidamo, Ethiopia relies on coffee as their main source of income. Coffee production accounts for approximately 5% of the world coffee market. Ethiopia ranks as the 5th largest coffee producer in the world. With approximately 15 million people involved in the coffee production process. The potential for coffee to create positive social change is significant. I interview Beti Berhanu Manager at Dumerso Coffee about her coffee journey and the impact coffee has on the community she works with. How did you become involved in the Dumerso coffee community? Beti Berhanu and her natural processed coffees. Burundi has only been producing coffee since the 1930s. It is a country shattered both by civil conflict and the widespread perception of the potato defect in specialty coffee. In the 1930s, coffee came to Burundi during colonial rule and has been hot-potatoeing from being publicly owned in 1933, private in 1962 after independence, public again in 1972, and finally private from 1991. Concurrent with these swings is the civil conflict that has also been detrimental to Burundi’s coffee production and value. There are significant barriers in producing specialty coffee in Burundi, including geographic location, bureaucracy and the widespread perception of the potato defect. Burundi is a land locked country located within East Africa (borders Rwanda to the North, Tanzania to the east and south, and the Democratic Republic of the Congo to the west). This is challenging because it is hard to maintain the coffee quality when transporting coffee from processing stations to buyers. The potato defect (alongside Rwanda) is also present in Burundi. In essence, this is where; the Antestia bug infects coffee berries by drilling a small hole into the skin of the coffee of the coffee fruit. So that when the coffee is roasted, beans taste like a raw potato. This has the potential to ruin an entire bag of coffee, and as such has the effect of deterring buyers from buying Burundi coffee. The Finca Loma La Gloria’s (LLG) story begins in the late nineties when Anny’s Dad, a civil engineer bought the farm and named it after her Great-Grandfather’s fruit-farm. Compared to other Salvadoran coffee growers (who have been in the industry for four generations or more), Anny notes that her family is ‘new’ to the industry. As a visionary, Anny’s father installed a coffee mill on the farm. When this was completed, the coffee crisis struck, and he decided to continue producing coffee cherries and sell them to local coffee millers, instead of running the coffee mill. As such, the coffee mill was abandoned. Anny with her nanolots and dogs. In 2012, Anny started contributing to the operations of LLG. Her operational work let her build relationships with roasters; engage in direct trade, and restore the abandoned coffee mill. She stresses that such restoration was important because it ensured high quality processing and traceability. So, what is an average day for you? I don’t have an average day. That’s the cherry of the pie. Anny taking a picture with her coffee beans before they are exported. Farm days include walking around the farm and inspecting the coffee, and seeing how all the operations are going. Mill days (pending on season), include inspecting the de-pulping process, drying, warehousing and dry milling. Cupping days are my favourite. These involve cupping with Francisco (head of quality control) and making decisions on our coffee offerings. Export days involve loading bags for export. I always inspect this process and take a picture with my beans before they head off. Car days include errands, from going to the hardware store, buying fertilizer, going to the bank, paperwork and sending samples. Desk days include logistics, reports and budgeting. While, hostess days are when I take visitors for a tour of the farm, the coffee mill and cup. How does coffee milling work? I don’t want to bore you with processing details. But it basically involves stripping the flesh off the coffee cherries and drying the beans. After they have dried, we put them in yute sacks, and store them in our warehouse to rest for at least one month. Then we take off flesh, classify them by weight, size and density. Then they are hand-sorted by approx. 15 women, who make sure you’ll get the nicest beans. Beans are bagged and exported. The Loma La Gloria mill was previously abandoned, how did you get the mill up and running? I didn’t think too much about it. I grabbed the bull by the horns and started running the mill. I wanted to have our own coffee mill so I could ensure quality, traceability and peace of mind. Though finding a good working team was crucial in the success of the process. Could you outline what are some of the challenges you have faced from being ‘new’ in the coffee industry? I have probably faced fewer challenges than an average coffee grower. Though, I’m not doing anything that hasn’t been done before. There are so many coffee growers/ millers that have been doing this for generations and have encountered challenges in a zero-internet era. They have had to move coffee on donkeys or horses and de-pulp on manual depulpers. There are still people who do that, and that’s really hard-work. I’m blessed in having my whole operation in a single site. I don’t need to move my cherries to a mill hours away and face the risk of robbery, fermentation time, etc. I have been blessed in receiving the best education I could get. My dad is a hard-working and visionary man. What I’m trying to say, is that I have faced challenges but it’s all about taking everything step by step, being responsible for your own decisions and consequences, problem solving and learning during the process. Coffee is all about relationships. It’s a language, that lets you connect with people all over the world. It’s about getting to know who buys, roasts, brews and drinks my coffee. One day, I hope to visit all the coffee shops that serve my coffee. I would love to spend a day at each one and get to know their customers. I would love to listen to their coffee stories and experiences. Coffee is my passion. I enjoy and love what I do. The best way I can describe it is; as men upgrade toy cars for real cars, I’ve upgraded to a Coffee Mill with a big garden (coffee plantation), instead of playing with Barbies and the Barbie mansion. This post appeared in Perfect Daily Grind. In many ways, La Roya (Coffee Rust) is like the flu. When there is a flu outbreak, this usually affects a lot of people. Those who are healthy, take of themselves and have strong immune systems, are less likely to be affected. This is the same with coffee plants. In my experience, I’ve seen multiple plantations with different farmers that have different experiences with La Roya. Farmers who keep their plants in good condition may not show any signs of La Roya, even though their neighbours have their whole plantation wiped out. I think that this is a cultural problem; farmers need to take better care of their plants and in the worst case, end up selling their land. The scientific name of coffee rust, is Hemilieia vastatrix. It survives primarily in the living tissues of coffee leaves, which makes it difficult to “survive” season to season. But, because some leaves survive during the dry season, this means coffee rust has the potential to infect new leaves at the start of the new season. The rust tends to develop around the margins of the leaf – where dew and rain droplets are concentrated, on the upper side of the leaf. Early on in the season, these lesions start at the bottom leaves of the coffee plant and then slowly migrate further up. These lower leaves then drop prematurely and leave bare twigs. Once a spore lands on a leaf, it germinates on the leaf and enters the leaf through the pore-like openings called stomata. Coffee rust spores can only germinate with free water. That’s why the unique “breeding ground” for coffee rust is the wet season. The whole process of infection needs about 24-48 hours of continuous free moisture. After infection, it takes about 10-14 days for the rust lesions to form and develop, and a further 2-3 weeks to enlarge. Infection occurs over a wide range of temperatures, between 15 degrees Celsius and 28 degrees Celsius, with the optimum being 22 degrees Celsius. Because of climate change, combined with changes in temperature and rainfall, this means that coffee rust is on the rise because of higher altitudes and increased moisture. What sort of impact has Coffee Rust / La Roya had on the ground? I asked Frosty from Tretto Caffé, Antigua Guatemala about the impact La Roya has had on the ground. He said that there are two spectrums, farmers who are significantly impacted, to not at all. The best example he highlighted was when he saw one cooperative producing enough to fill 10 containers one year, but after La Roya only being able to fill one container the next. This meant that some families with eight people would only have one tenth of the money to survive during the year. These families also have to then invest money in fighting the La Roya, or cut their trees and wait two years for their next formal harvest. In essence Frosty says that people are struggling, where the spectrum ranges from one family not being able to buy a fancy meal every day, to actually seeing your children dying from hunger because you can’t feed them for over a month. This happened to a whole family in Santa Rosa, a really poor rural area, where 400 people were impacted and only two could speak Spanish, with the rest speaking their Mayan language. What’s being done to combat La Roya? I spoke to a few correspondents who had insight on what’s being done to combat La Roya. Through such discussions there wasn’t a unique “one fits all approach.” Andy Gelman, green bean buyer for Coffee Bird said that some trees are cut at knee height, and because the roots were okay, this meant that the cut plants would take 2-3 years to regrow again. This is opposed to re-planting a seed which would take 5-7 years to produce decent amounts of fruit. Frosty noted that a lot of people had to sell their land, because they didn’t have enough money to recover. Farmers who did have the resources started planting alternative crops like corn and avocado. Acknowledgments to Frosty (Tretto Caffé, Antigua Guatemala), Andy Gelman (Omar and the Marvellous Coffee Bird, Melbourne Australia), Zach Latimore, Zach Daggett and Anny Ruth Pimental (Loma La Gloria, El Salvador). Muller RA, Berry D, Avelino J & Bieysse D. 2009. Coffee Diseases. In: Wintgens, N., editor. Coffee: Growing, Processing, Sustainable Production. Wiley-VCH Verlag GmbH & Co. KGaA. p. 491-545. Avelino J, Zelaya H, Merlo A, Pineda A, Ordonez M & Savary S. 2006. The intensity of a coffee rust epidemic is dependent on production situations. Ecological Modelling 197(3-4):431-447.